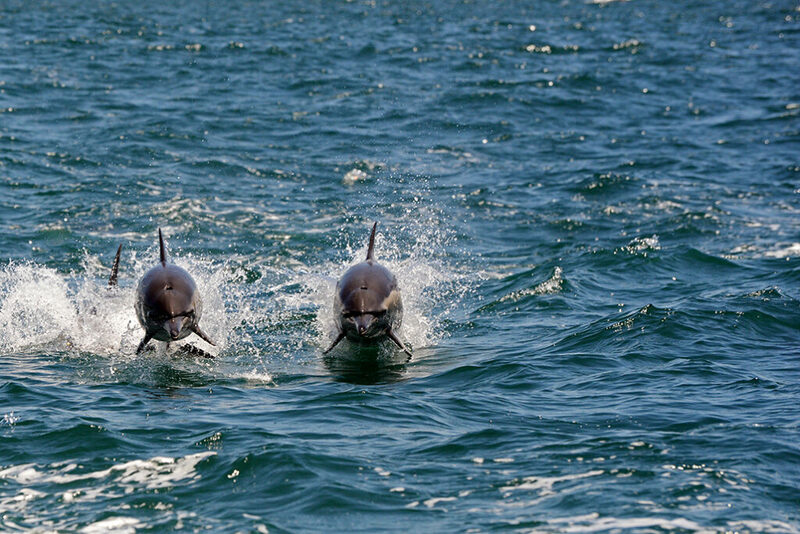 Common dolphins swimming just outside of the Knysna Heads. 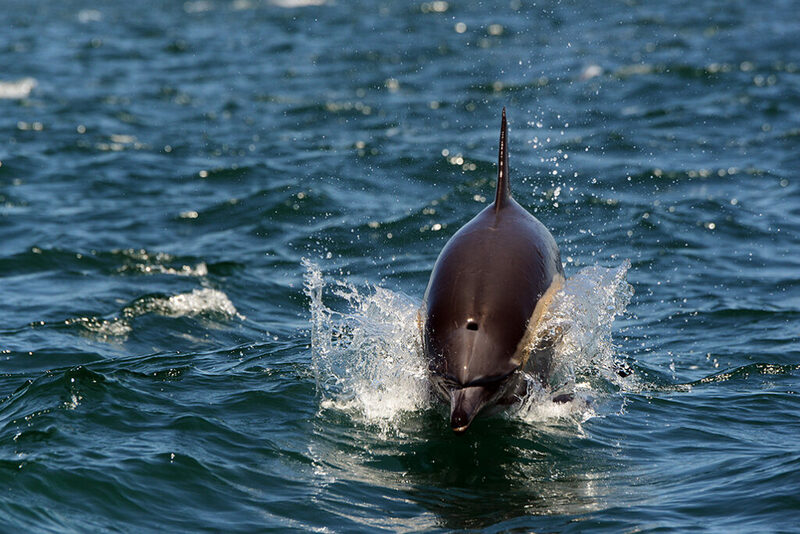 Seeing a large pod of long-beaked common dolphins (Delphinus capensis) moving swiftly through their wild ocean home is an experience that you are unlikely to forget. 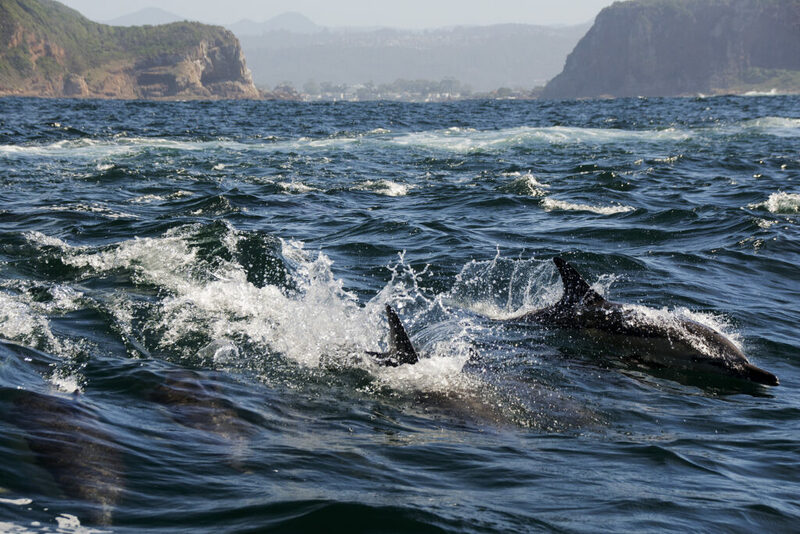 It is one of the most thrilling marine spectacles we are fortunate enough to observe off our Garden Route coastline and each time – we are left humbled and in awe of these sentient cetaceans. Common dolphins are sleek and streamlined and can grow to lengths of up to 2.5 metres. The body is dark-brown to black with characteristic, orange-brown markings on the sides and a creamy-white underbelly. The head slopes gently forward to a narrow beak and the dorsal fin is quite prominent and slightly hooked. A dark stripe extends up from the pectoral fins to the lower jaw and another joins the back of the beak to around the eye. Streamlined and hydrodynamic, common dolphins are the perfectly designed for their ocean realm. 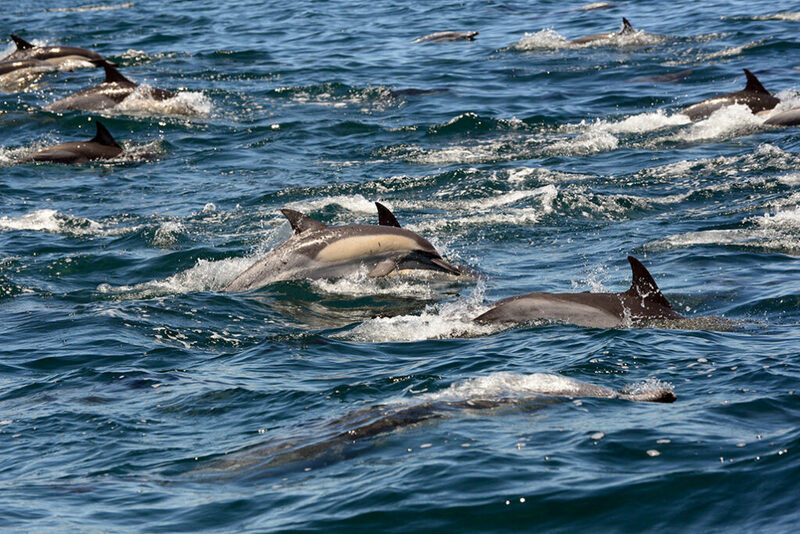 Common dolphins are usually found in large groups of between 300 to 5000 (although a super-pod with up to 100 000 dolphins was once seen off the coast of California in 2015). The speed at which they move is quite dizzying, and watching them swim effortlessly through the water is a constant reminder of the miracle of nature’s design. Perfectly streamlined and hydrodynamic, these animals have evolved for both speed and endurance, their bodies designed to reduce drag at high speeds. They also boast extremely flexible flukes, which scientists have found become stiffer the faster the dolphin swims, increasing its swimming efficiency at high speeds. 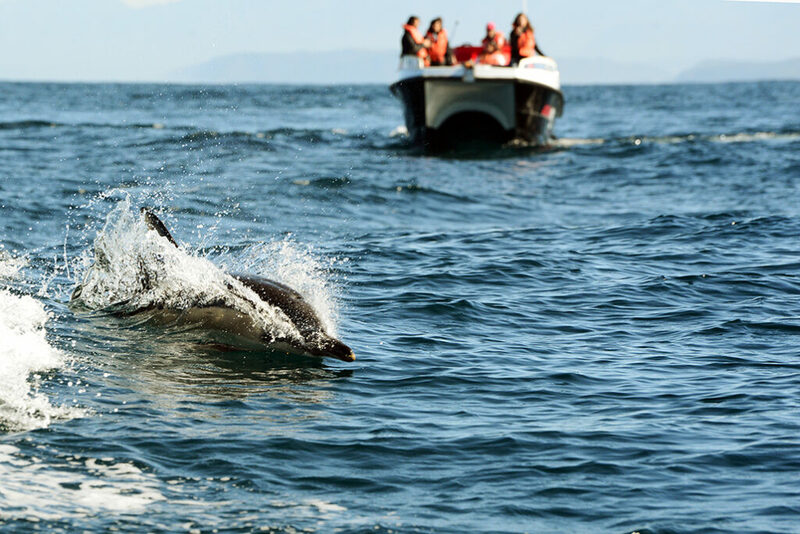 Extremely playful, they love to surf the wake of a boat, which is thrilling to all those on board our Ocean Odyssey vessel. 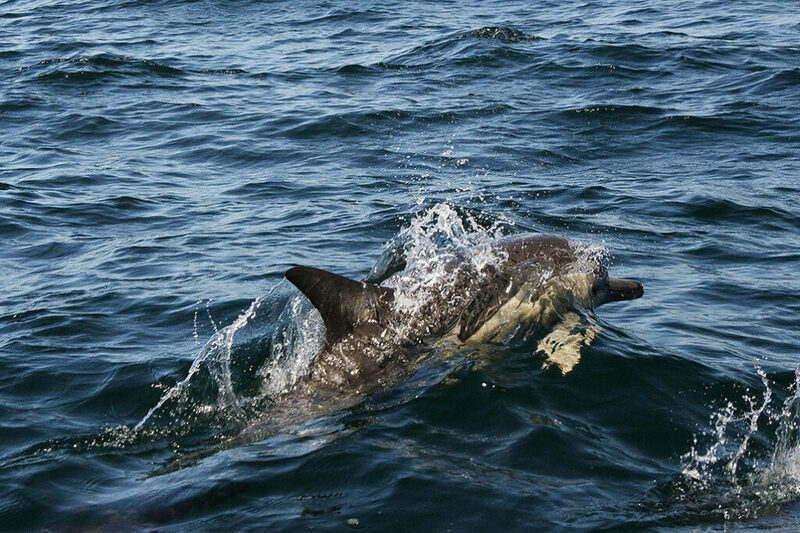 Guest on board Ocean Odyssey observing these wild and free common dolphins. Common dolphins are usually found in deeper coastal waters, however they are occasionally seen closer to shore in large numbers in the Western Cape and Kwazulu Natal during the sardine run, which is an epic migration (annually, if conditions are right) of millions of sardines which serves to lure hundreds of different species in a gigantic feeding frenzy. Large pod of commons pursuing bait fish. As with most dolphin species, common dolphins are highly sociable and super smart. In fact, they sit among the apex of marine species intelligence, with some scientists believing that the social intelligence of these cetaceans competes with that of the great apes. One merely needs to watch them in action to realise the complexity of their social bonds and their extraordinary methods of communication and feeding. Common dolphin captured at high speed above the water. Perhaps the reason why we love them so much is that we have much in common. They can process information from their environment in a similar way to humans: they are playful, have the capacity for joy and sadness and they are constantly collaborating with one another (and sometimes even with animals of other species which our whale spotter witnessed previously in the past.) They have an immense capacity for learning and mastering certain things, which researchers have documented both in captive and wild environments. During our Ocean Odyssey tours, we frequently see both the inshore bottlenose dolphin as well as the Indian Ocean humpback dolphin, but every now and again we encounter a huge pod of commons. In recent weeks we have been lucky enough to see several pods and we are hoping that large shoals of bait fish will lure them back to our shores very soon! !